Need a sweeper for road construction, asphalt paving or milling? 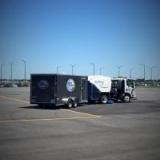 MAINLINE SWEEPING, LLC is the Professional Team to call! We are a family-owned and operated business with a low overhead and a quality work ethic. We know the value of communication with our customers so we are all 'on the same page' when it comes to the job at hand. Our management team offers over 25 years of targeted sweeping in heavy duty road and construction sweeping. We have many, many satisfied customers and offer a level of service and capabilitiy that is unmatched in our service area. Our fleet of Elgin Whirlwind Series L sweepers are durable and productive. You will find our sweepers are well maintained and kept in top sweeping condition. Not only are our operators experienced and well-trained; in addition, all have been schooled in the basic mechanics on the sweeper they operate. That means that, in the event of a minor malfunction or if a component becomes mis-aligned, they are able to repair the issue immediately. Each sweeper is outfitted with a complete toolkit, which allows our operators to make sure their sweeper is in top sweeping condition at all times. Our Elgin machines have legendary pickup capability, while keeping noise and dust to an absolute minimum. Because our operators offer years of experience, you will find they can maximize the use of our sweepers on your jobsite. We help our customers save time and that means you can make more on the job! 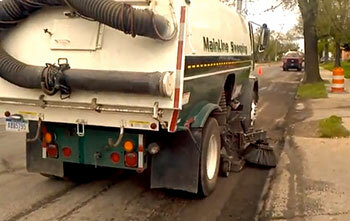 MAINLINE SWEEPING provides complete roadway and construction sweeping throughout the Greater Detroit Metro area. This includes the nearby market areas of Ann Arbor, Dearborn, Flat Rock, Monroe, Canton and Belleville. If you're not sure if we're in our worksite area, just give us a call. Even if it is not an area we serve we'll be glad to assist you in finding the right contractor for the job. With our many years in the industry in this area, we are well acquainted with the other sweeping companies nearby. 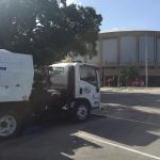 Check out this YouTube link to see one of our sweepers on a jobsite. Please use the information shown to the right to let us know how we might assist you in making your next sweeping job the most professional and trouble-free ever!